The Lady and I made our second cheese this past weekend. 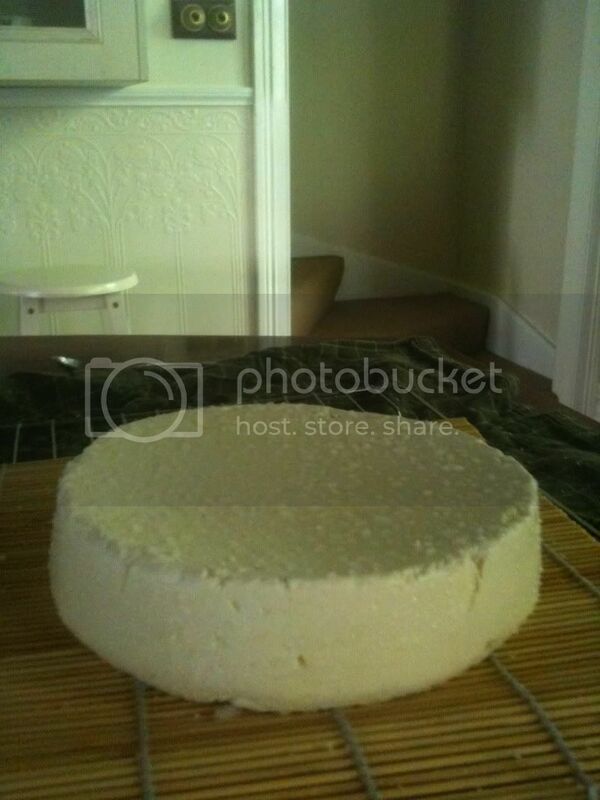 The first was a feta a couple of weeks ago that turned out very nicely indeed (much to our surprise). 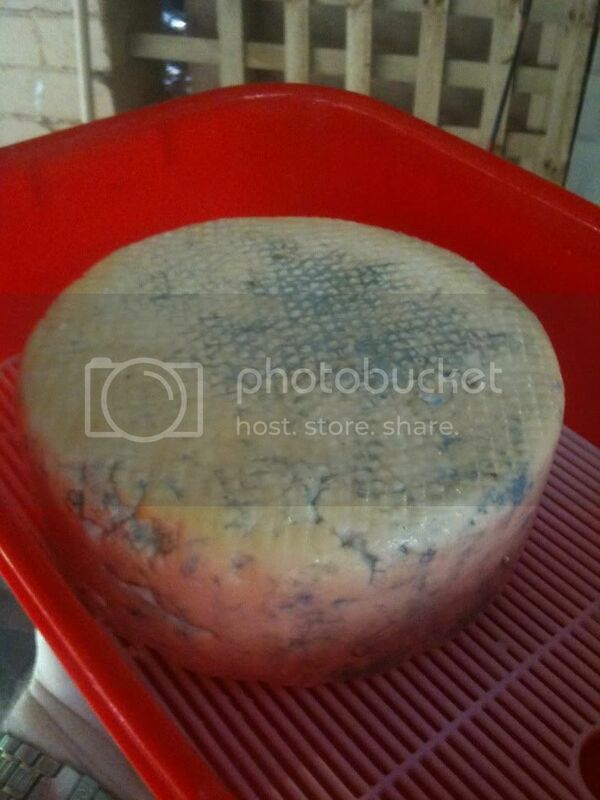 Here's a pic of our latest, a cheddar that should be ready in about 6-9 months. Give it a go, it's quite fun and very satisfying. There's tons of recipes online, so go for your life- a blue is next on the list for us. where are you going to store that cheese while it's ageing? i'm assuming that relatively constant, cool temperature would be required? It gets waxed in a few days, then goes into the spare fridge, running on its warmest setting. About 10 degrees c.
keep us posted on how it turns out! I'm not sure about you, but I don't consider the products of poor hygiene "food". Well done! The cheese looks like a bought one. I can't think of anywhere I could store it at a constant 10 degrees or I'd give it a go. My end room sits at about 4 degrees for 8 months of the year. Great for storing beer in winter but probably a bit cold for ripening cheese. If you make smaller ones does it ripen more quickly? Love to hear how it turns out. Good question! I had to look it up to check. Small ones do ripen faster, so ours might take a while. It's currently the size of a small birthday cake. We're also looking into adding an agent that breaks down proteins (luckily my wife is a scientist) and accelerates the development of flavor in cheese. Our cheddar is waxed and aging nicely, and the blue we made recently is also busy doing its thing. 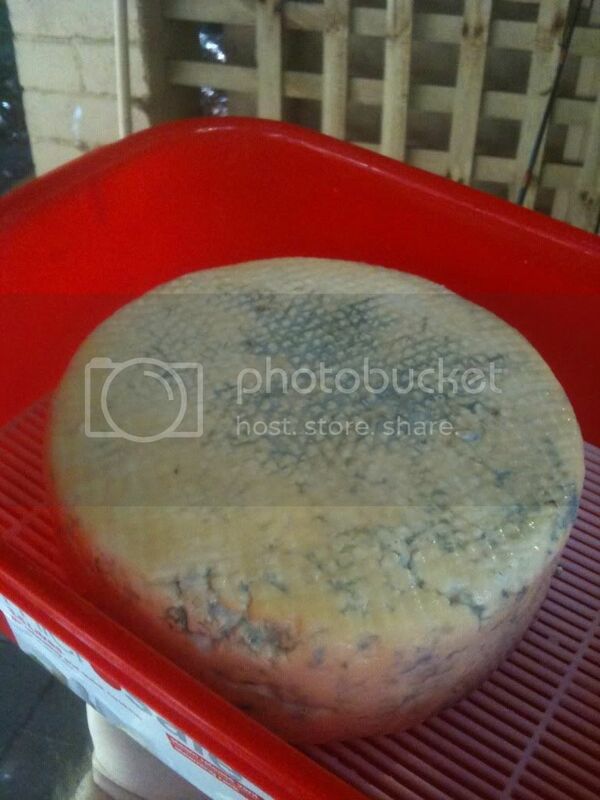 It has just given birth to its first blue mould, and I look forward to seeing it bloom over the next couple of weeks. Next up for the Easter weekend, a Brie! With the blue do you dip some wire in the culture and poke it into the cheese? I was thinking that I don't eat that much cheese but when I added it up I figured that I cook with a fair bit and I buy vintage parmesan and blue which is expensive. Quattro formaggi pasta/pizza. I'm thinking that if the cheese has a shelf life then it may involve less waste than I first thought given the size of the block of cheddar that you posted. This is a concern for me cos I hate wasting food. Can you make parmesan? If so I will have to rethink. I don't know how the law stands now but there was talk of banning cheeses that were made from unpasteurised milk a while back. I have bought roquefort in the last few years so the ban may have been lifted. Making your own would seem to be a pretty good workaround. From the little I know of cheese making the techniques seem to have evolved in different regions. Are the techniques wildly different for brie versus blue? Brie I thought had a high cream content. Where are you getting your milk from? Are there recipes?
. I don't know how the law stands now but there was talk of banning cheeses that were made from unpasteurised milk a while back. I have bought roquefort in the last few years so the ban may have been lifted. Making your own would seem to be a pretty good workaround. I hate to rain on your Roquefort parade, but most of the stuff that is exported from France is pasteurised. There are a couple of producers there who make 'Roquefort' from pasteurised milk as there is a big market for it in the US... and a smaller one here. Making your own cheese from _any_ unpasteurised milk is a good work-around... if you can find the unpasteurised milk. It's generally only available on the black market these days, or in some areas by buying a share in a cow; that then entitles you to the unpasteurised milk from that beast. The rules are pretty tight these days. And although TB is no longer a problem, brucellosis - undulant fever - is still quite prevalent, so do be careful where you get your unpasteurised milk from. It's better I know the truth R Roquefort, walnut and celery quiche. Damn good recipe. I'll try and drag it out. At one point I remember that parmesan was going to be banned. Sanity must have prevailed at least a little bit cos I can still buy it. I'll wager that unpasteurised milk will be easier to source than saltpetre. Will Studd is the guy who challenged the ruling. I must google it and see the state of play. Sorry about the delay lads, my phone broke! I have further pics to share, but I'll answer the questions first. 1) Yes, in about 2 weeks we'll be poking holes in the blue with some sterilised skewers of some description. 2) I haven't made parmesan yet, but we intend to soon. As I understood it, there used to be a ban, but you can get unpasteurised cheese here now. Having said that, and question 3) in order to increase the relative benefits of our efforts, we've been buying whole milk from Aldi (buck a litre- can't go wrong) and it's working fine. So, that being the case, our 2 kilos of cheddar and blue will cost us a grand total of $16 in milk. 4) techniques- the basic technique for all of them in fairly similar. You warm the milk, add starter culture + calcium chloride (+ any other cultures such as roqueforti for blue, or white mould for brie), let it coagulate for an hour or so, add rennet, leave another hour or so, then drain. It's at this point the procedures change. For cheddar we had to weigh down the cheese with 10 kgs for a day or so, then air dry for 4-5 days. Blue just got gently pressed into the mould and went into the fridge sooner. 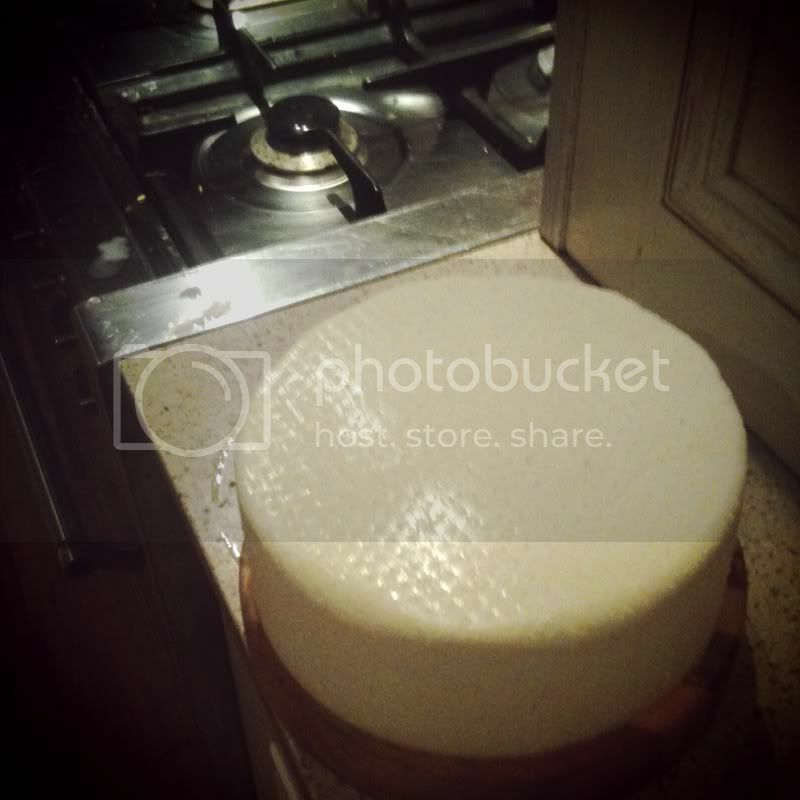 Our latest, a brie, had half as much milk as the others, and went into the fridge after draining overnight (draining whey that is). You asked for recipes: as always, forums are the most useful resource. We are on this one, and you can see lots of recipes, plus plenty of hilarious cheese disasters. Finally, here are some new photos. Our blue has bloomed, and our brie will be ready in about six weeks. nice pics. im impressed that you can make such cheese. It's really not that hard, but the key is to be very clean, sterilise things as much as possible. That's some nice looking cheese sir. Bullsh*t has walked. My hat is off. Don't remove hats until I'm sure it's edible! I thought we were allowed it now. We have papillon at the local deli and I am pretty sure that isn't pasteurised. I'm sure I've had unpasteurised cheese. A while back one of the hotels in Sydney CBD were having a cheese buffet, and Mrs Pursuivant and I went. My lungs were filled with awesome cheese. Some unpasteurised cheeses are allowed in - including papillon, as it happens - but most are not. Most of what is allowed in tends to be harder, longer-aged cheeses. I'd be surprised if too many traditional, stinky, unpasteurised cheeses are being allowed in. It's all very pointless and contrived. No it's not! those french people are dying by the thousands from unpasteurised cheeses, and the ones that live are weak and inneffectual! The surrendering and de-evolution into monkeys is a side-effect of the cheese eating, clearly. Who needs the French stuff, lads? Better off sticking to the Wensleydale, Gromit.